I don’t want to call Tuesday night’s game boring. There were some interesting shifts and Pekka Rinne was absolutely dominant for all 60 minutes. This was probably one of the Nashville Predators’ best games, but did it feel like a complete effort? The Toronto Maple Leafs are a speedy team that thrives on stretch passes. These passes are meant to catch the other team sleeping in order to create an odd man rush and an easy zone exit. For the majority of the game, the Predators did a great job of containing the stretch, but in the process left the middle of the ice open. Guys like Auston Matthews and Mitch Marner took full advantage, but the rest of the Leafs couldn’t keep up with the Predators forecheck. It was an interesting strategy that had as many pros as it did cons. All in all, the Maple Leafs controlled 53.52% of shot attempts and 61.67% of scoring chances. The Predators did better in terms of quality, 54.55% of high danger chances, but the Leafs controlled the puck in terms of pure possession. This was clearly a team second-guessing itself as it achieved its fourth loss in five games. It’s not often that JoFA gets dominated and the Predators still win, but it happened. The top line truly had no answer for Mitch Marner and his ability to transition the puck from defense to offense. Arvidsson was invisible for most of the night, but he did take a slap shot off the inner leg and I think that stung him. Forsberg had flashes, but nothing of real substance. Ryan Johansen had a really good night in my opinion, but most of it happened away from his usual linemates. His steal, which led to Brian Boyle’s goal, was excellent and his shorthanded chance was incredible. He was everywhere on the ice, although it didn’t amount to much. The second line was kind of weird. My eye test thought they were floundering, but their stats are awesome. My biggest issue is that Bonino and Simmonds are not fast enough to keep up with Granlund, but they managed to create some decent offensive zone pressure. They did get quite a bit of shelter in terms of zone starts and quality of competition, but at least they created with it. They were a low event line, but at least in a good way. Here’s another line that didn’t really match my eye test. I thought Sissons was ok for most of the game, but he looked like he was chasing the puck all night, and not in a good way. Nevertheless, they faced the Matthews’ line and came out on top, which is to be admired. I will say though, Pekka Rinne did a lot of the heavy lifting in terms of keeping him off the score sheet. I’m very glad that Brian Boyle got a goal, but otherwise this line was a non-factor. They were consistently beaten by a meager Leafs’ fourth line and had a lot of trouble getting out of the defensive zone. The good news is that they didn’t give up a single high danger chance, although they didn’t create any either. Please take Turris off this line and give him linemates that have hands. No offense to Grimaldi or Boyle, but Turris made quite a few passes to soft areas that turned into nothing because his mates couldn’t handle it. It’s hard to get mad at the forwards because they won. I understand wanting to play a slow game and keeping things simple, but the offense didn’t really do that much to create anything. Six high danger chances at five on five and seven in all situations isn’t enough, especially against such a god awful defense. It felt like the forwards were so worried about making a mistake that they decided to not try anything too creative unless it had a 100% projected success rate. This was a great opportunity for the offense to try new things, but now it feels like they did “just” enough to win. Besides that one beautiful pass made by Ellis to create Wayne Simmonds’ goal, I think the first pairing wasn’t very good. They had some good moments at exiting the defensive zone. But more often than not, once the puck was in, it was in. Josi was chasing the puck like a dog chasing cars which left Ellis to hyperactively watch the net-front. Their zone entry defense was also tragic, as Matthews had four or five opportunities off the rush. It wasn’t their best night, but it could’ve been worse. Mattias Ekholm and P.K. Subban are finally regaining their form. It’s been a tough year with new linemates and injuries creating a bit of havoc, but this duo is finding new ways to play better. As I said before, Marner was a nightmare as he dominated zone entries, but he never really had a chance to come to the middle. Subban’s active stick and Ekholm’s body positioning kept Marner to the outskirts and away from the dangerous areas. They had some issues with sustained time in their own zone, but everyone did. All in all, they were the best defensive unit tonight. I really should give the third unit an “F”, but they didn’t give up a goal so hooray. They only had three face-off starts all night and two were in the defensive zone. I’m a little scared of what might happen to these two in the playoffs. The defense had an up and down night. They were physical and fast, but had trouble keeping their form throughout the game. My biggest issue was with Josi, who kept getting caught deep in the offensive zone which led to Auston Matthews and William Nylander taking on Ryan Ellis and a forward in odd-man rushes. I understand that Josi’s ability to create a rush opportunity is what makes him unique, but he needs to do a better job of picking his spots. He’s lucky he had Rinne, but the entire defense is lucky they had Rinne. 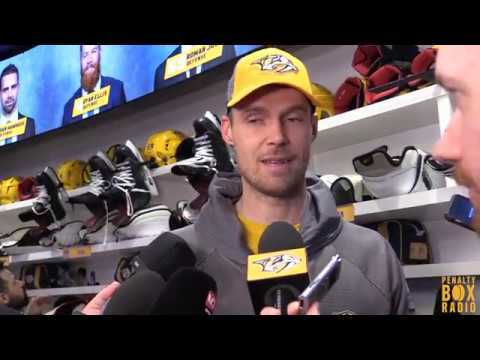 As Hilaire Belloc wrote in 1898, “Whatever happens, we have got, The Pekka Rinne, and they have not.” Ok, maybe that isn’t the original quote, but the point stands. Teams understand who’s in net and the risks they can take because of it. Rinne must be the ultimate insurance policy, as the Predators routinely left him out to dry, yet Rinne came up big time after time. This was a perfect goaltending performance, plain and simple. Rinne was great whenever he was called upon. There’s nothing else to really say about it, besides that maybe the club should look towards making his job easier on most nights.